Der Sieger ist Davide Vergoni. Herzlichen Gl�ckwunsch! Gl�ckw�nsche geb�hren auch Lars Rosengren, Christian Seibold, Fabian Dickmann und David Joachim, die sich in die Top 8, Top 4 und ins Finale gespielt haben! An beiden Tagen wird die Text-Coverage von einer Live-Video-Coverage via Twitch begleitet. Die Kommentatoren sind Simon G�rtzen, Riley Knight und Rapha�l L�vy. F�r weitere Infos siehe das GP Utrecht Fact Sheet. 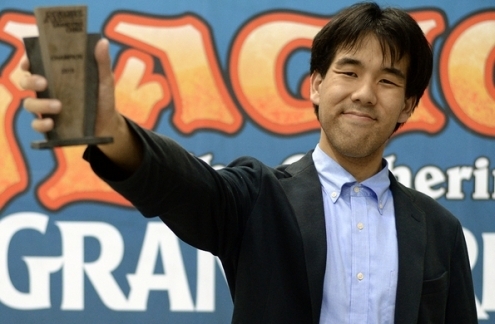 Der Sieger ist Yuki Matsumoto. Herzlichen Gl�ckwunsch! An beiden Tagen wird die Text-Coverage von einer Live-Video-Coverage via Twitch am ersten Tag und via Twitch2 am zweiten Tag begleitet. Die Kommentatoren sind Matej Zatlkaj, Frank Karsten und Nate Price. F�r weitere Infos siehe das GP Chiba Fact Sheet. Der Sieger ist Aaron Lewis. Herzlichen Gl�ckwunsch! An beiden Tagen wird die Text-Coverage von einer Live-Video-Coverage via Twitch begleitet. Die Kommentatoren sind Marshall Sutcliffe, Randy Buehler & Gabe Carleton-Barnes. F�r weitere Infos siehe das GP Las Vegas Fact Sheet. Der Sieger ist Scott Markeson. Herzlichen Gl�ckwunsch! An beiden Tagen wird die Text-Coverage von einer Live-Video-Coverage via Twitch begleitet. Die Kommentatoren sind Kenji Egashira und Ben Hayes. 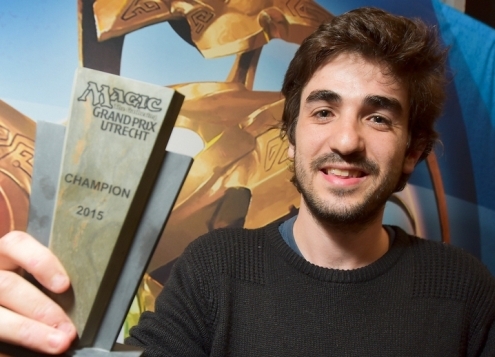 F�r weitere Infos siehe das GP Las Vegas Fact Sheet (Channel Fireball). Die Links und Infos werden im Laufe der Turnierfortschritte aktualisiert. Sch�nes Wochenende! You should bring maro a ham and cheese sandwichm but hide a small piece of banana in the middle! Fight Owens fight or talk Owens talk? A banana a day keeps the head designer away? [+]Not that I have observed, and I love bananas. do you think that a playtest sticker has ever been stickered over a 'Goyf? [+]I have seen it happen. [+]Eureka continues to resolve. Once a spell starts resolving, it continues even if it leaves the stack in the middle. This is basically how cards that say ?Exile CARDNAME? work. [+]The sheer amount of sweet swag at this event is unbelievable, and Nick Miller is here to tell you about what you get when you register to join the Modern Magic party that will be Grand Prix Charlotte! [+]This is a StarCityGames.com® Premium Article. Click here to sign up.Watch Pro Tour Champion Ari Lax show you how to set the Modern format on fire before you hit #SCGINVI and Grand Prix Charlotte! [+]Lots of games will be won and lost depending on how you've chosen to use and build your sideboard! Let Anthony explain just how intricate the Burn sideboarding science is before Grand Prix Charlotte and this weekend's #SCGINVI! [+]This is a StarCityGames.com® Premium Article. Click here to sign up.#SCGINVI's Standard portion is going to have a big impact on who takes home the trophy and the cash, and these two decks are recent exciting developments that could serve you well on your weekend run! [+]Grand Prix Charlotte and the Modern portion of the #SCGINVI will be defined by Tarmogoyf, Snapcaster Mage, and...Glissa, the Traitor? See this crazy Glissa brew before you sleeve up your contender! [+]xboxdaily: Does this new teaser mean Bethesda is about to reveal Fallout 4? I?m giddy with excitement that this could be it? [+]fresh-prince-of-beleren: jacethemindblogger: I hope this is what you meant. :) I GOT GOOSEBUMPSAnd I heard the sound they make in my head. If you?re considering buying a card from MM2, here's a reason buy now vs later. Thanks for crushing me with a secure the wastes for 0 yesterday. Hi Mark! Today is my birthday. :-) Can I get a little trivia on my favorite card of all time... Cryptic Command? [+]The command cycle was designed by Aaron Forsythe who loves modal cards and was trying to ?one up? charms. Happy Birthday! I don't think it's right to call something "reprinted" if it's from Future Sight. Instead, I consider it to have been "preprinted" then, and is getting it's first printing now. [+]If you?re talking about the future-shifted cards. Just remember the majority of the cards from the set weren?t future-shifted. [+]Blue is #2 in discard but a distant #2. How hard is it to come up with a good idea for Steamflogger Boss? I've seen several interesting suggestions on forums, and I can't imagine you having trouble with it. [+]My goal is to do it without contradicting any of the rules laid down for it. *That* is much harder. Okay, we know about a 0/0 undying so would a 1/1 persist creature be the same odds? Okay, then what's the difference between Jayemdae Tome and a red creature with the same CMC and same cost (perhaps with R included) to draw a card? [+]One is in Red and the other isn?t. Given that you like the Lhurgoyf flavortext so much, are you responsible for the flavortext on Revenant? What is blue's current relationship with direct damage? [+]The future-shifted cards are from potential futures. We?ll see some of them. Dear Maro: Is Green still allowed to have repeatable fight effects such as Ulvenwald Tracker and Domri Rade, or is that considered too good for Standard now? Thank you. [+]It is colorpiewise. I?m not sure developmentally. Can you tell us any more about Time Duel? It sounds pretty interesting. Can the Azure Mage and Scroll Thief abilities be moved out of blue and into green. Both mechanically feel green, given that they are repeatable card draw dependent on creatures. [+]That ability is in Blue *and* Green. Is there a possibility of a Planar Chaos like supplemental set similar to how Conspiracy was released? [+]A very low one. The color pie affects everything not just tournament Magic. Would you have picked the Foil Tarmogoyf? [+]I love a good story. I would have picked the best card for my deck. I was looking up playtest stickers and noticed they've changed a lot over the years. Have you considered an article about the ways they've changed? [+]Perhaps. Would others be interested in this topic? [+]The (Not So) Secret Origin of Maro: For those that love learning more about my life prior coming to Wizards, this article?s for you. Frage (17223): Kann ich mit dem Schim�rischen Ei (Chimeric Egg) auch angreifen, sofern es gen�gend viele Ladungsmarken hat, um zu einer Kreatur zu werden? [+]Dissatisfied with the current Modern options, and a control player at heart, Ali takes a look at a unique Esper deck in Modern and also has a word with the deck's creator, Francesco Amati. True-Name Nemesis, Chaos Warp, and Hornet Queen all seem like color pie violators. They also all came from Commander products. Is there simply less oversite of these product's color pie adherence? [+]I?m usually the one that oversees color pie issues and I wasn?t as vigilant on the supplemental products because I was less involved with them. The problem is getting fixed for the future though. Send�??? for my muses reaction to yours giving them flowers. The M15 cardframe was originally meant to be saved for Magic Origins, was it? [+]No. Magic Origins, in its current form, didn?t exist when the issue was decided. [+]stufftoblowyourmind: Believe it or not, concerned parents, pastors and advocacy groups believed the ?Dungeons and Dragons? roleplaying game was a gateway to madness, occult violence and suicide. Let?s explore why?